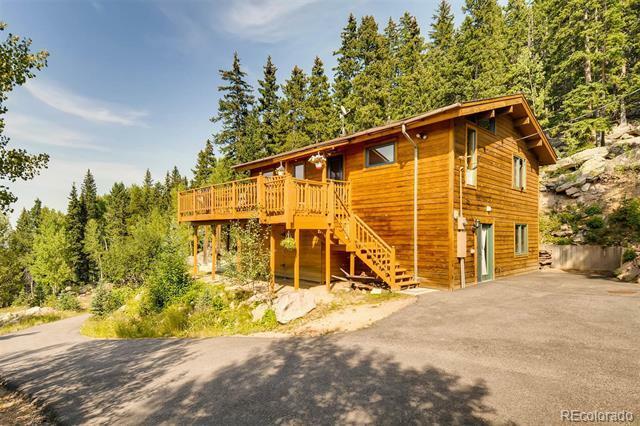 If you are looking for a secluded mountain getaway with stunning views, this cozy home with a wrap around deck is for you. There are 5 beautiful wooded acres filled with large moss rock everywhere you look. The 1,600 square foot garage with 12ft. door is awesome for a workshop as well as a family with an RV, snowmobiles, motorcycles, ATV's, and cars too. Don't miss the steam sauna/shower in the master bathroom. 3 bedroom, 2 bathrooms (one full and one 3/4) Wood burning fireplace upstairs and a wood burning stove downstairs. Walk-out lower level. In addition, a well for water and there is a dog-run with a doggie door.